.We are a family owned and runed Taxi- and Executive Car Service Company. 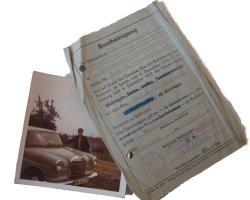 The first Executive Car was established over 45 years ago in Ingolstadt by Walter Siegel the Grandfather. At the picture left you see Franziska Siegel "Fanny", his wife at work with her 1966 Mercedes and his original concession for public passenger accomodation from 1960. Nowadays we offer you a wide field of carters for all chauffeur drive services around Munich and the Munich airport. We are happy about our long business relationship with our clients, such as first-class hotels, companies in each size from each branch, and agencies. at reasonable and affordable prices. Ask as we may be able to accommodate if it is not on the list. 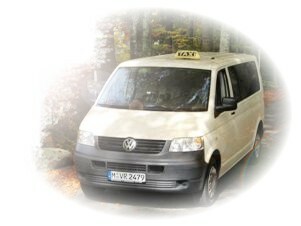 We use cars up to 8 Seater Mini Buses. Our friendly drivers speak english, are police screened, medically checked and full licensed. Our goal is to provide you the best service. To contact us use the form on the left selection-bar.